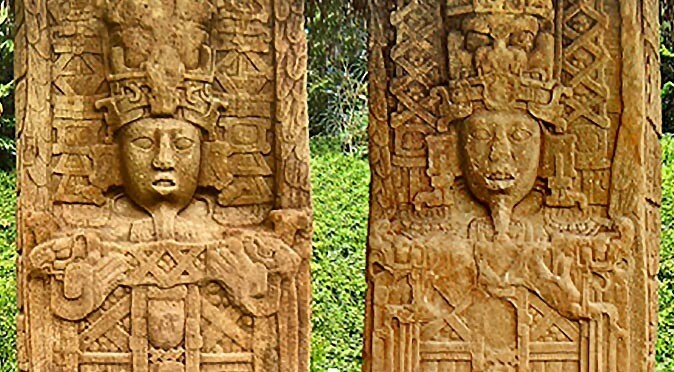 Quirigua is renowned for two things, its towering stelae and the beastly zoomorphs that are scattered about the archaeological zone. 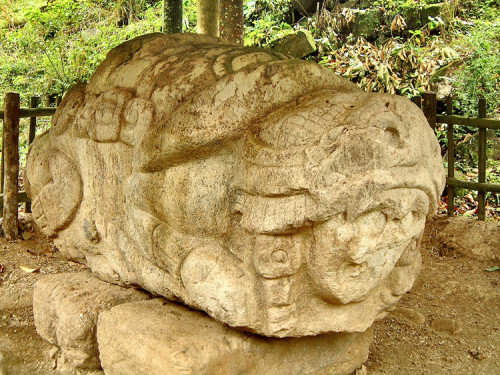 The idea of zoomorphism is not unique to Quiriguá, in fact it can be seen in art and religion of ancient cultures across the globe. 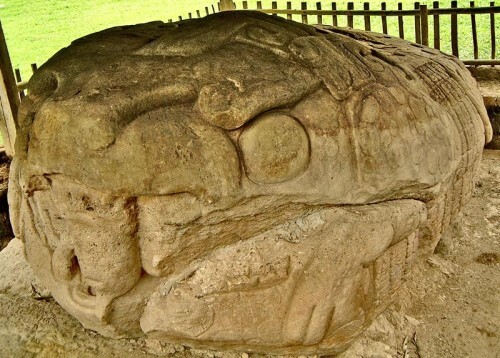 At Quiriguá the concept was monumentalised like nowhere else on Earth, with a team of highly skilled craftsmen dedicated to carving huge pieces of rock into fantastical animal-forms for the best part of 50 years. 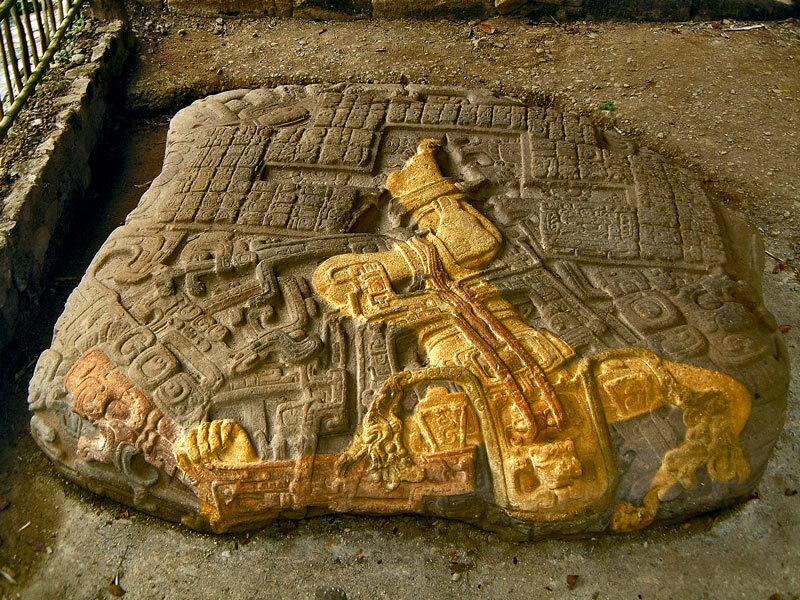 The distinctly unique results are monstrous in every sense and are considered to be the finest artwork ever realised by the Maya. 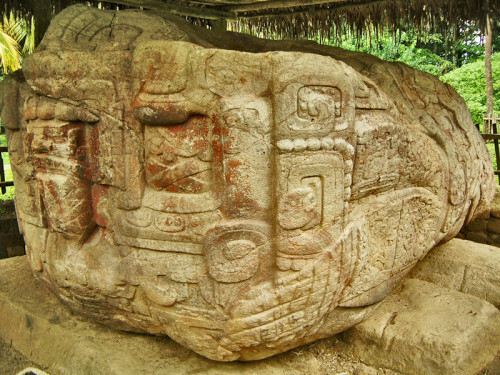 The zoomorphs at Quirigua are like three-dimensional books designed to provide information about the ruler, their power and their conquests. Almost every square inch of these highly decorative monuments is dedicated to imparting information. The largest is Zoomorph P, which weighs in at 20 tons and provides a surface area of 402 metres on which every square-centimetre was ornately engraved. As well as demonstrating the incredible craftsmanship of this often maligned sub-continent, the beastly characters and the glyphs are blended seamlessly together and highlights the meticulous planning that must have taken place before these enormous rocks were even hewn from the ground. 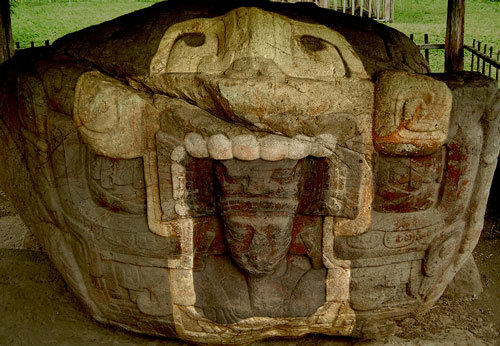 The monuments at Quirigua were built to celebrate the completion of 5 Tuns (or a quarter K’atun), which is a period of 1800 days – roughly 5 years. The four large Zoomorfo were built consecutively, starting in 780AD, and are almost certainly linked to the Maya Creation Myth in some way. There are also two smaller zoomorphs, of which the function is uncertain. 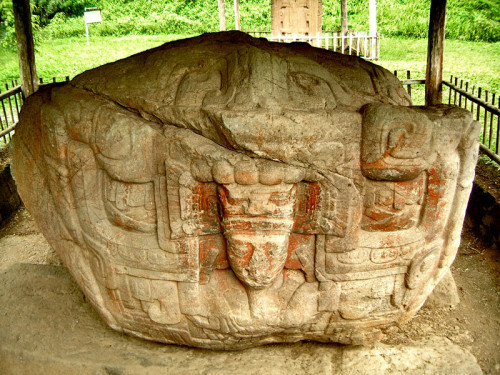 The most significant Zoomorfo at Quiriguá is probably Zoomorph B. Dedicated by Cauac Sky on 9.17.10.0.0, 12 Ahau 8 Pax (30th November 780AD), Zoomorph B appears to be part of a trinity of stones that relate to the Creation Myth (covered in a separate article entitled “The Maya Creation Stones“). At first glance, it looks like a fairly rough lump of rock covered in a haphazardly artistic array of curves, squiggles, and spirals with the head of Cauac Sky carved on the front. However, it is probably a combination of five different forms, which share many elements. As you can see from the gallery below, the often hard to spot animals are there in plain sight and when you know what to look for it becomes quite clear. The three images on the second row of gallery above highlights the three different animal forms depicted on Zoomorph B. As you can see, they very cleverly share elements. 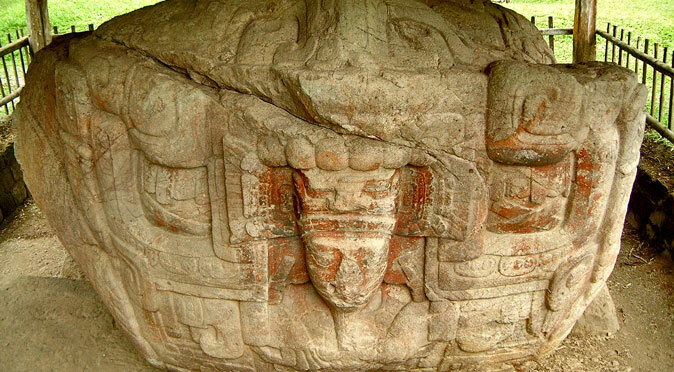 Obviously the mouth is used by both the Jaguar and the Snake, the Jaguar’s eyes could also be the nostrils of the serpent, and remarkably the Jaguar’s ear is used again as the Snake’s furrowed eyebrow and again as the crocodile’s snout. These three animal forms are not just representative of animal powers wielded by the great monster from which Cauac Sky is being born, but they also relate to the three “Stones of Creation”, the Jaguar Stone, the Snake Throne and the Water Throne, which Itzamna ties together to create the Divine Throne for humanity’s first ruler (click here to read more on this…). But the symbolism does not stop there. From the front, Zoomorph B also takes the shape of a turtle shell with Cauac Sky’s head emerging from it. This is symbolic of the birth of the First Father who was born through the shell of a turtle, meanwhile the overall shape is also symbolic of a hearthstone. 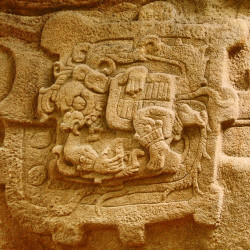 W1000: Zoomorfo B – Close-Up of Winal Glyph So the symbolism of Zoomorph B includes a Jaguar, a Snake, a Crocodile, a turtle shell, a hearthstone, the three stones of creation, the Divine Throne of the First Father and the birth of Cauac Sky as the First Father. As well as representing these many things, there is also plenty of room for hieroglyphs along the sides and back. These glyphs are in an unusual highly decorative style, such as the odd winal glyph that appears to depict a jester being mauled by a defleshed jaguar (see fig. W1000). 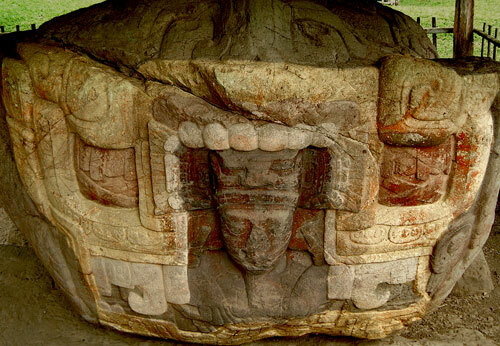 These glyphs provide additional information, such as the date it was dedicated, who it was built for, and even the name of the beast it depicts (which, although badly eroded, appears to list the name of Itzamna). Zoomorph G was the second of the large Zoomorfo monuments and was dedicated by Cauac Sky’s successor, Sky Xul, on 9.17.15.0.0, 4 Ahua 3 Muan, which corresponds to the 4th November 785AD. This quarter K’atun celebration fell just 85 days after the Cauac Sky passed away, and so Zoomorph G seems to have been turned into a cenotaph to this mighty ruler. Zoomorph G is clearly representative of a amphibious beast, but it is not certain whether it depicts a crocodile, jaguar or toad. W0993: Zoomorph G The encoded images are a lot clearer on this Zoomorph, especially on the left hand side (fig W0994) where you can see the large clawed hand and crocodilian body shape. However, the head does not fit and in fig. W0976 you can see the stubby snarling snout looks far more like that of a jaguar. The damage sustained to the face of the beast makes it very hard to tell, but there are some hand drawings that make it look very much like a toad. Despite the damage, you can still see the distinctive beard of Cauac Sky. 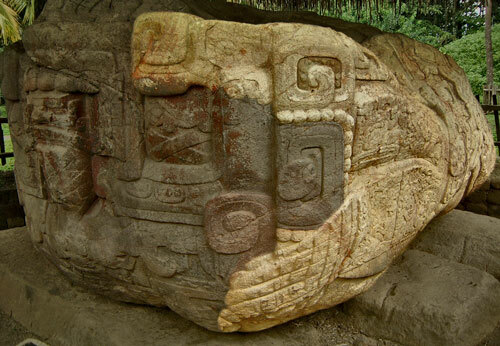 To find out more about Zoomorph G and the inscription on it, go to the article “Quirigua: Zoomorph G“. W0978: Zoomorfo OZoomorph O was the third of the large Zoomorph Monuments and was dedicated by Sky Xul on 9.18.0.0.0, 11 Ahau 18 Mac, which equates to the 7th October 790AD. The other end of the monument, which would be the animal end, is almost entirely defaced, but the scant remains suggest it is also a crocodilian, but merged with a deer in a form known as the Starry Deer Crocodile. 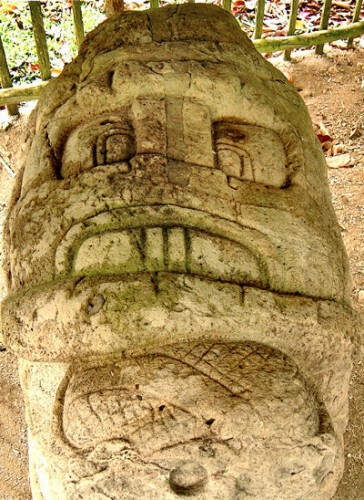 Much of the text on the monument talks about the accession of Sky Xul, which had taken place 5 years earlier (the monument erected for that quarter K’atun was dedicated almost entirely to the death of Quiriguá’s greatest ruler, Cauac Sky). 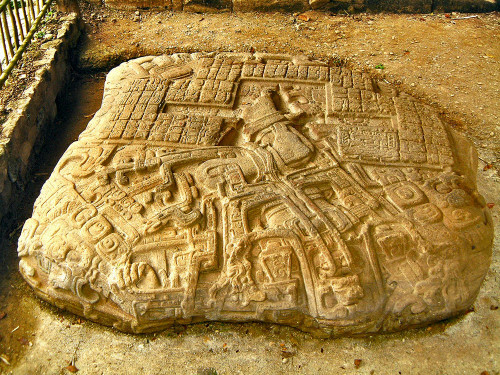 Zoomorph P is the largest of the Zoomorfo at Quirigua at probably the finest monument in all of Mesoamerica. Weighing over 20 tons, Zoomorph P stands 2m tall, measures 3.5m wide and 3m long. It provides a surface area of around 402 metres and every square-centimetre is engraved with information. In the gallery below, you will see Zoomorph P marries two key principles; firstly, the king rests in the jaws of a mythical beast; secondly, he holds the “Manikin Sceptre” and shield, which is shown on many of the stelae. Zoomorph P features a different ruler, Sky Xul, who was probably the son of Cauac Sky. The piece was dedicated by Sky Xul during the celebrations of 9.18.5.0.0, 4 Ahau 13 Cej, which translates to the 13th September 795AD. 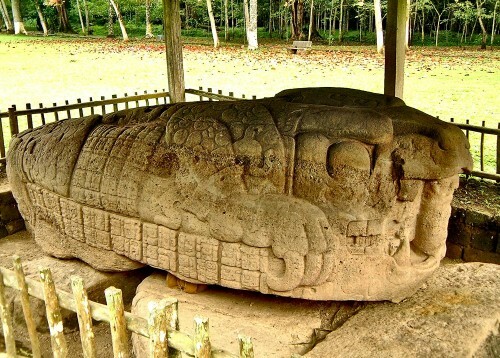 In size and statue-form, it is very similar to Zoomorph B, but it doesn’t appear to feature the same interlocking imagery of the Jaguar, Snake, and Crocodile. 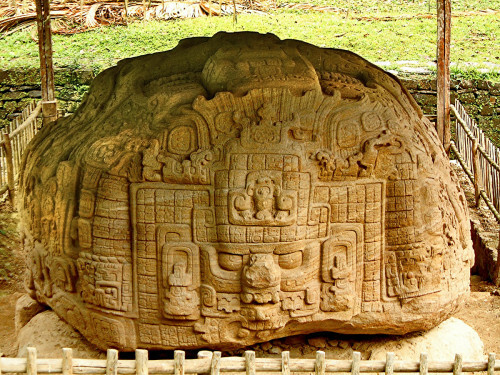 In fact, it seems to solely focus on the sacred Turtle with the ruler, Sky Xul, being born from it in a re-enactment of the birth of the First Father. The jaws in which he sits are vastly different to those of Zoomorph B and look distinctly elephant-like (there were no elephants in the Americas) and there are obvious parallels between this entire monument and the artwork of the Hindu, whose new age, the Kali Yuga, curiously began at the same time as the Maya’s, around 3100BC. However, without getting distracted by such speculation, the jaws are presumably those of a Turtle, so we have the entire monument dedicated to a single animal, the turtle. W0974: Zoomorfo PAt the other end of Zoomorph P is the image of the Cosmic Monster. 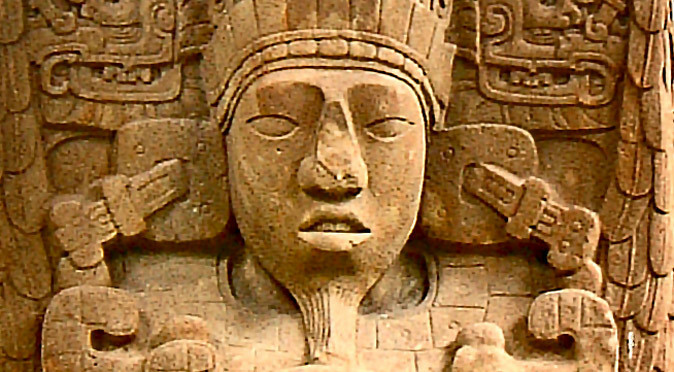 His face is a very familiar sight at Quirigua as he features on the headdress of Quiriguá’s rulers on all of the Stelae around the site. He is also known as the Bird God and Itzamna. 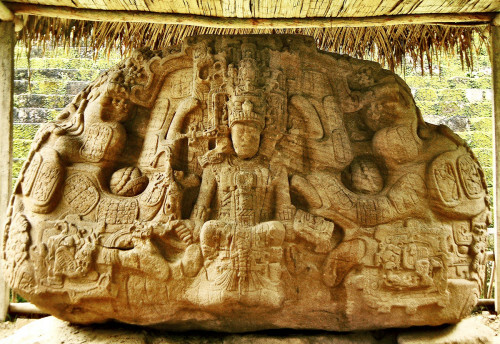 Itzamna was also mentioned on Stela C as being the God who tied the three stones of creation to create the sacred throne for the first ruler of a new mankind. On this side there is a possibility that the three animals are merged. The very left-hand edge of the stone as seen in fig. W0974 is the gaping jaws of a crocodile, with the upper jaw spanning all the way to the top of the monument and the lower jaw spanning all the way to the front. The square frame of glyphs around the God’s face is also reminiscent of a gaping mouth, with eyes just above and either side of the headdress. There is also a pair of eyes on top of the monument, which you can just about see in fig. W0974, and between the eyes appears to be a set of fanged teeth. 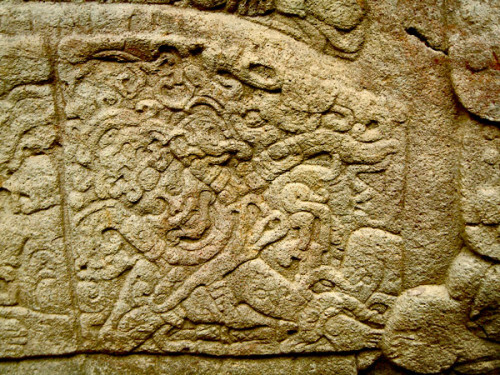 To cap off the mystery, the roles seem to have been reversed on this side, with the God Itzamna appearing from the beasts jaws with an image of Sky Xul on his headdress. W0976: Zoomorfo P – Close UpTo give an idea of the complexity of the carvings on this mighty monument, fig. W0976 is a close-up of the creature that embellishes the bottom-right of Zoomorph P, as seen in fig W0975. This little creature appears to be surrounded by the double headed serpent, with the two heads meeting above his back, then he has the nose and fangs of a serpent on an otherwise human skeletal head. He appears to be capturing a small beast with his right hand and holding a shield in front of his body with his left hand. This appears in some way related to the Manikin Sceptre and may be telling us about how it was created or what its meaning is. Altar P was Altar P is paired with Zoomorph P and built at the same time. 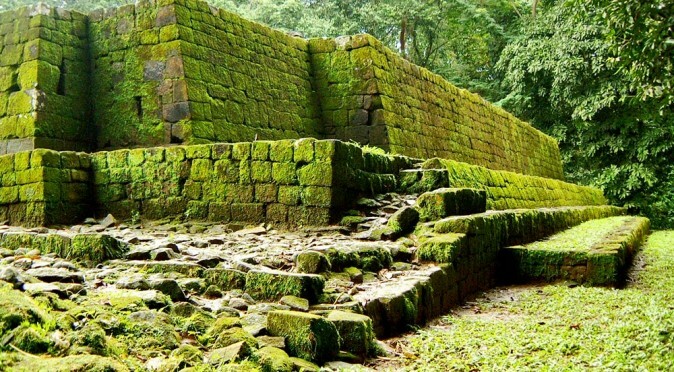 Its imagery is rather hard to fathom at first glance, because there is obviously a foot in the middle of the stone, but it doesn’t seem to lead anywhere. It is actually part of a character whose body and head lie perpendicular to the leg – and is therefore completely upside down (see fig. W0977H below). W0977H: Altar P – HighlightedThe highlighted image of fig. W0977H shows clearly how the character is lying on his back with his head coming directly towards us and hanging over the edge of the altar. With the incredible planning that must have gone into the Zoomorphs, it is impossible to believe the head overhangs the altar because they ran out of room, so this must be a deliberate effect. The result is that he looks as though he lies on the altar in preparation of being sacrificed or in death. The “V” shape that is distinctly visible around his feet is symbolic of a split in the ground (or rather the opening of mother earth). The “V” shape was often used to symbolise the womb, so this imagery suggests this character is either being born, reincarnated or returning to the womb of mother earth. The unusual positioning of the feet, with one leg raised and bent across the other, suggests that he is performing a ritual dance. Combine all these factors, and the most likely explanation of this scene is that the character is performing a ritual dance before falling in to the ground to be reborn. It is not known who the character is. The face is obviously quite monstrous and the tongue is bifurcated like a serpent’s. His hair is also comprised of a double headed serpent, flowing like plaits but ending with serpent heads. He also holds a serpent bar in his left hand. The serpent was seen has having the power to slip between the surface and the underworld, so all this serpentine imagery may be telling us that this person also has the power to transverse the world of the living and the dead. W0981: Altar MZoomorph M is the earliest of the Zoomorfo and was dedicated by Cauac Sky in 9.15.0.0.0, 4 Ahua 13 Yax, which equates to 20th August 731AD. 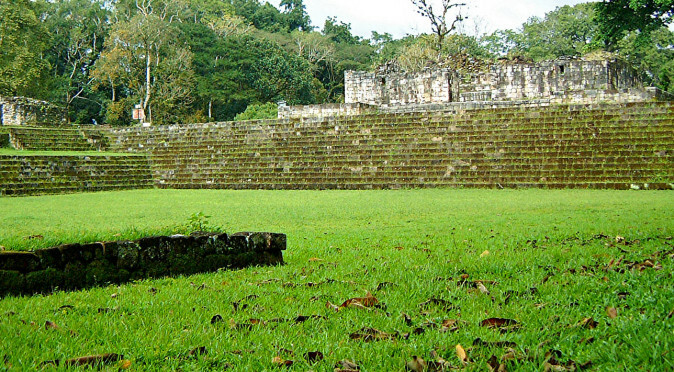 This pre-dates Quiriguá’s battle for independence and the influx of finances that it brought. 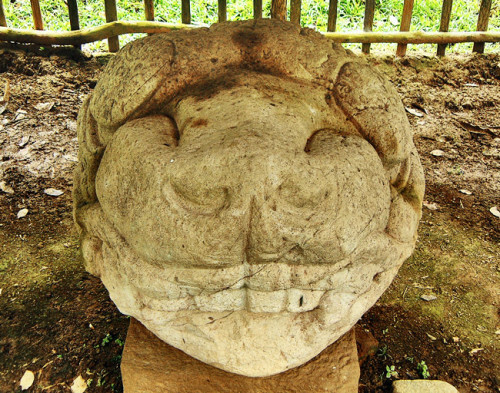 This is apparent in the basic form of the monument, but while it may lack the artistic embellishments and grand scale of the subsequent Zoomorphs, it is clearly a precursor to the subsequent style, featuring a feline face from the front, but a distinctly crocodilian form from the side. This and Zoomorph N are classed as altars, but the may easily be thrones that were sat upon, which is thematically closer to the Zoomorphs that followed. 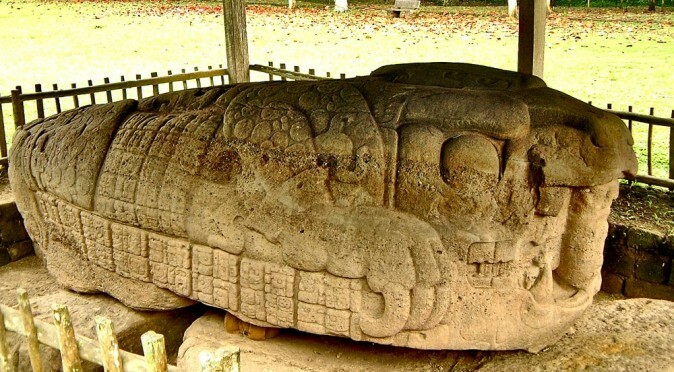 There is a very important text on the rear of this Zoomorph that are though to provide the earliest indication that Cauac Sky was contemplating taking control of Quiriguá independently of Copán (click here to read more…). Zoomorph N, also known as Altar N, is stylistically very similar to Zoomorph M in size, shape and the choice of rhyolite as the material. Zoomorph N is was unusually not dedicated with glyphs, therefore it is not known when, or why, it was made. 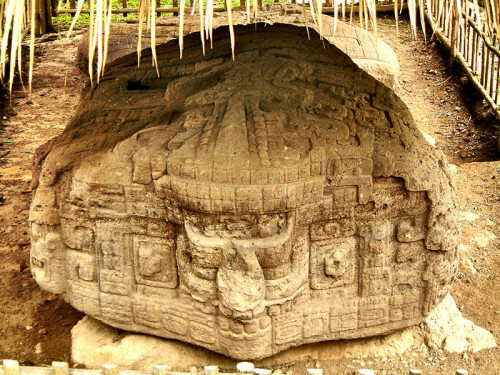 The similarity to Altar M suggests that it was constructed at a very similar time, if not the same time, and so Altar N can be given an approximate date of 731AD. There is a unmistakably turtle-like form to Zoomorph N, with heads emanating from both ends. At one end is a skull that is curiously rotated by 45º; at the other end is the head is of a goofy old man wearing a cloth hat or hair-net, with human-like arms. 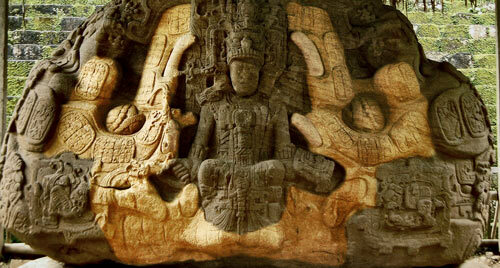 This old man is a deity named God N and his hat is thought to be made of crocodile skin rather than a net. God N, also named Pauahtun, is the patron of writing (or scribes) who also takes on the role of the four Bakabs to hold up the sky in the four corners of the universe (cardinal points). He wears a shell on his back, which is thought to represent the Earth – so he effectively is the bearer of the world or universe. 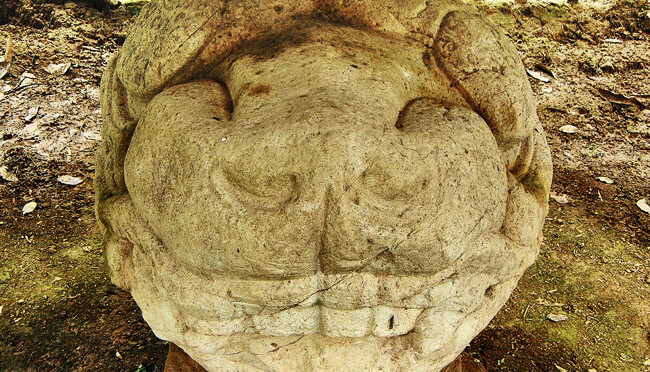 On top of the monument, the turtle shell is actually a face of a goofy monster with a beard, almost identical to one found at Comalcalco ( see fig. W0979) – however, this is apparently the wrong way up and the goofy mouth is actually tufts of hair and the face is supposedly of the bird-monster, also known as God D or Itzamna.